Source: Johansen, Jørgen. 2009. 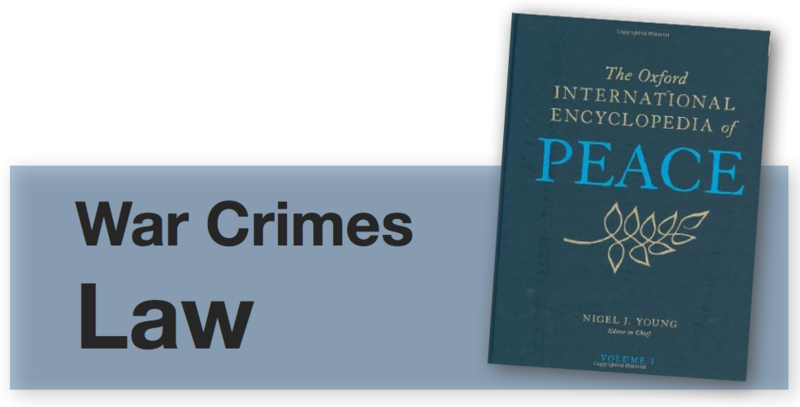 “War Crimes Law.” In The Oxford international encyclopedia of peace, edited by Nigel Young, 339-341. Oxford: Oxford University Press. War crimes can be defined as “violations of the laws or customs of war.” The laws referred to are a set of international treaties and conventions. Treaties between actors in conflicts have a long history, going at least as far back as we have written sources. Violations of such treaties were the first formal war crimes. The Background to Modern Laws. Before there were laws in the modern sense, religious texts were used as guides on how to act in conflicts. Several holy books include rules and identify obligations on how to act toward other human beings when there is a conflict. Modern laws on war crimes derive from two ancient concepts, the jus ad bellum and jus in bello. The first of these draws up criteria for when war is a legal means in conflicts between states; the second identifies what sort of means are acceptable in times of war. Each is still in the process of developing. Medieval Roman Catholic teachings on bellum justum (just war) were for a long time the starting point for legal and moral discussions of war “laws,” and hence of war crimes. The 6 April 1320 Declaration of Arbroath, proclaiming Scotland’s status as a sovereign state and its right to use military means if unjustly attacked, provides an early example of war crimes laws. But war crimes grew more common with the rise of mercenary armies in the period 1500–1650, and peace treaties of the early sixteenth century indicate a collapse of the medieval system of legal order in Europe; with the weakening of the Catholic Church in the Reformation, lawlessness grew. Three peace treaties, beginning with that of Westphalia in 1648, have long been regarded as the birth certificates of the modern European state system and the law of nations. But the roots of the new system can actually be traced from around 1450, and the Dutch jurist Hugo Grotius (1583–1645) and others built a base for the post-Westphalia law systems. Medieval and Renaissance Europe defined itself as a cultural, religious, political, and juridical unity, the respublica christiana. The pope and the Holy Roman emperor were in theory the supreme leaders, overseeing a framework of Roman, canon, and feudal laws. The Peace of Westphalia ushered in sovereignty for states and rules for handling conflicts between them. Since then laws, treaties, and conventions have developed in a continuous process. One of the first international attempts to regulate, in peacetime, behavior in war led to a declaration signed in 1856 in Paris, to abolish the licensing of private warships, or “privateers.” The United States refused to join in the ban. In 1864 the first of the Geneva Conventions was adopted. It covers the protection and treatment of battlefield casualties, both military and civilian, and was created along with the establishment of the International Committee of the Red Cross. A declaration prohibiting unnecessarily harmful types of weapons and ammunition was signed in St. Petersburg, Russia, in 1868; as with many other declarations, this was binding only in case of war between signatories. The Hague Conventions were a result of two peace conferences held in the Hague in 1899 and 1907. They covered a wide range of topics relating to conflicts between signatory states. A number of countries were not part of the international system at this time, though, and several political units other than states controlled territories. Conflicts between entities other than signatories, or civil wars or other armed encounters, were not covered by these conventions. From the 1899 Hague conference four sections and three declarations were accepted. The first section urged states to work for pacific settlements of international disputes. The next made a clear distinction between soldiers and civilians. Numbers three and four dealt respectively with maritime warfare and a prohibition on launching projectiles and explosives from balloons, or “by other new methods of a similar nature.” No air force existed at that moment, but the Italian lieutenant Giulio Cavotti dropped the first bomb from an airplane outside Tripoli, Libya, on November 1, 1911, and in 1915 the Germans dropped the first bombs on civilian targets, in London. Other parts of the 1899 Hague documents followed up on and gave specifications relating to previous agreements. Thus Declaration Three, which amplified the 1868 St. Petersburg declaration, made it illegal to use bullets that expand or flatten easily in the human body (“dumdum” bullets). Eight years later the second Hague conference produced thirteen conventions during its 1907 session. All except one were ratified. asked states to do their best to obviate the use of force and to ensure the pacific settlement of international differences. One convention from 1907 asked that “contracting powers agree not to have recourse to armed force for the recovery of contract debts.” Another asked for a warning or declaration of war before the use of military means in a conflict. And one convention dealt with battles on land and respect for laws and customs. Modern customary law based on Hague convention VI Article 3 lays down the broad principle that a belligerent state shall pay compensation for all violations of the laws of war. In addition two 1907 declarations were signed; one of these promoted obligatory arbitration. After World War I several new treaties focused on the protection of civilians in case of war. All of these laws were violated by both the Axis and the Allies in World War II. German and Japanese officers were condemned in the Tokyo and Nuremberg trials, but the massive bombing of civilians in Germany and Japan was never brought up in a court after the war, nor were mass killings of civilians and prisoners, especially on the eastern front in Europe (as by the Soviets in Poland’s Katyn Forest). After the end of World War II the creation of United Nations made an important difference in the development of war crimes laws. The UN Charter itself was an important contribution to improvement of the international system to regulate conflicts between states. The UN Security Council was given power to decide when war was justified, and its interpretations were accorded precedential power. All members of UN are according to article 25 in the UN Charter responsible for implementing decisions by the Security Council. In some cases the council could also intervene in a civil war or when serious atrocities were committed by a sovereign state against its own population. This option was not much used in the first decades after 1945, and is still contested, but events like the massacres in Rwanda in 1994 have convinced many that this right must be accepted. But the Security Council has been very reluctant and did not support either the NATO bombing of Serbia in 1999 or the occupation of Iraq in 2003 . The public justifications for these wars was not accepted by the Security Council. In its Resolution 177 the UN General Assembly in 1945 formulated the principles on which the Nuremberg Tribunal would be conducted. The concepts of “war crimes, crimes against peace, and crimes against humanity” were based on the London Charter of the International Military Tribunal agreed on by the Allies in the days between the dropping of the first and the second atomic bombs on Japanese civilians. Paragraph 1 of the charter specifies that only crimes committed by the Axis powers will be punished, and a similar tribunal was set up to prosecute crimes committed by Japanese forces during the war. Both these tribunals have been criticized for not dealing with crimes committed by the winners, and for employing ex post facto laws. In 1949 four important conventions were agreed on by more than forty states in Geneva. Today almost every country have ratified these conventions. With additional protocols drawn up in 1977, they provide a base for specific legal protection of three categories of people affected by wars: soldiers, prisoners of war, and civilians. All four conventions were based on previous revisions and partly on some of the 1907 Hague Conventions. The International Criminal Court (ICC) was established by United Nations General Assembly in 2002 as a permanent tribunal to prosecute individuals for genocide, crimes against humanity, war crimes, and the crime of aggression. It can in principle be used to prosecute all such crimes committed after July 1, 2002. The Court can exercise jurisdiction only in cases where the accused is a national of a state party, where the alleged crime took place on the territory of a state party, or where a situation is referred to the court by the Security Council. Some states—among them China, Yemen, the United States, Israel, India, and Iraq—do not recognize the ICC. The International Criminal Court and the 1997 convention prohibiting antipersonnel mines are examples of war crimes laws established after campaigns by a global civil society. Most of the war crimes laws were designed to be used in conflicts where states are the main actors. Today most armed, large-scale conflicts have involved several other types. Guerrillas, networks, and rioters are just some other examples; few war crimes laws are applicable to such actors. Several recent situations have found major actors on the international scene arguing in favor of using these laws on others (not the laws’ intended targets). After September 11, 2001, the U.S. government gained support from the NATO council in using Article 5 of the NATO charter in treating the event as a military attack affording the right to self-defense. UN Security Council Resolution 1368 also gave the United States the right to self-defense. It should be noted that it did not specify the occupation of Afghanistan and Iraq as methods of self-defense. Ambos, Kai, and Jörg Arnold. Der Irak-Krieg und das Völkerrecht. Berlin: Berliner Wissenscahfts-Verlag, 2004. Bailey, Sydney D. Prohibitions and Restraints in War. London: Oxford University Press, 1972. Broomhall, Bruce. International Justice and the International Criminal Court: Between Sovereignty and the Rule of Law. Oxford and New York: Oxford University Press, 2003. Kalshoven, Frits. The Law of Warfare: A Summary of Its Recent History and Trends in Development. Leiden, the Netherlands: Sijthoff, 1973. Lesaffer, Randall (ed.) Peace Treaties and International Law in European History: From the Late Middle Ages to World War One. Cambridge, U.K. and New York: Cambridge University Press, 2004.